The Vivace has some of the best drive units in the world, a crossover screened with material from the Stealth aircraft programme and a ‘quiet’ cabinet of synthetic wood so dense that it is used as a neutron shield in nuclear research and will stop .357 Magnum bullets. Praise has been heaped on the Vivace’s bigger brother, the Classic, with numerous ‘best sound at the show’ comments. Now this very clever, even deceptive, slim-fronted Vivace floor-stander design is claiming similar comments but for a speaker at a much lower price. The design concept is to bring the scale, power and transparency of physically big speakers, too dominant for many rooms, in a package no larger than conventional floor-standers. Credit for that achievement goes to the incredibly dense, ‘quiet’ cabinets – beasts to manufacture – that allow the drive units to project their sound energy from a vibration-free platform. Here is a review by Paul Messenger in hifi+ magazine. It’s worth reading the four pages of the review more than once because there are several layers to peel back. See also our reaction below*, highlighting how his opinions developed with further listening. The design expertise behind the speakers comes from Rainer Weber of Kaiser Acoustics in Bavaria who is an acoustics consultant to companies like Mercedes Benz and BMW in the automotive industry. He has designed the Vivace and Kawero to produce a hall-filling sound with lifelike instruments and voices, yet from a domestically-friendly, compact cabinet. How is this possible with only a ribbon tweeter and a small cone driver visible on the front? However a second mid-range driver and a bass unit on the back achieve the right scale, power and balance in the listening room. This concept is based on the human ear’s response that needs 2 milliseconds to distinguish a noise from a musical tone. After that time the ambient sound in a typical room starts to contribute a lot to what the listener hears, so the Vivace designers have used extensive acoustics modelling to ensure that the direct and reflected sound-field combine correctly, with all the tonal colours of the sound in perfect harmony. This clever concept means that the Vivace works with the room, not fighting it and setting up difficult modes. Speaker set-up to avoid ‘beaming’ the sound at the listener is further helped by the pivoting tweeter cabinet that also adjusts forwards and backwards to allow precise time alignment for the listener’s position. The result is a wide-open, huge soundstage in which the loudspeakers completely disappear. What is left is a truly three-dimensional musical picture that simply hangs in space in the listening room, offering width, depth and height separation for the performers. Major contributors to the performance are the best ScanSpeak drive units, the Illuminators, the Mundorf Air Motion Transformer tweeter and the Tankwood cabinet material, formed when beechwood is injected with resin and compressed under high temperature and 2,000 atmospheres of pressure to create new chemical bonds. Kaiser have found that not only does Tankwood have excellent damping properties but also is perfect for musicality, natural tone richness and authentic timbral colour. Most other conventional cabinet materials have their own recognisable character. Our connection with Kaiser and the Vivace speakers comes through our strong association with Vertex AQ. Their EMI and RFI absorption technology is applied at the most effective point possible – right in the heart of the crossover – using the materials and design knowledge employed in their HiRez products. The benefit is a huge jump in transparency, separation and fine detail as the crossover components now work in an environment ‘cleaned’ of electrical and mechanical pollution. Vertex have developed other acoustic products with the Kaiser company, using the combination of Vertex’s expertise, Herr Weber’s acoustic knowledge and the superb manufacturing facilities in the Kaiser factory – see the story on the Vertex site: Kaiser Project See also the practical application of Kaiser acoustic treatments under Room Acoustics on this site. The Vivaces can be finished in a wide choice of wood veneers and painted in almost any colour to suit a customer’s décor. Above is an example finished in a Burgundy red while here is one in Lamborghini Orange. Prices will be affected by these choices but start from just over £22,000 per pair and rise to about £30,000 with options including a carbon fibre baffle with a high gloss finish, like the examples here. Frequency response is quoted as 29Hz – 26kHz within an extraordinarily precise in-room response of ± 1.5dB. Sensitivity is 88dB for 1 Watt and minimum impedance is 3.4Ohm, meaning the speakers can be easily driven by amplifiers from 50W output. As always though, more power on hand is never a drawback, giving even greater dynamic range, scale and excitement. The extraordinarily dense Tankwood gives these speakers a weight of about 85kg each with the heavy Vertex crossover. In Issue 82 of hifi+ magazine there is an excellent and comprehensive review of our Kawero! Vivace loudspeaker. 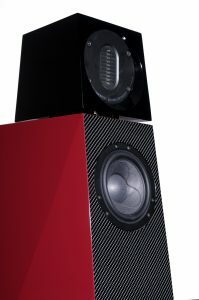 Paul Messenger, highly-regarded as one of the most experienced loudspeaker reviewers, has brought to life his listening with the speakers over several weeks. After these changes and as he lived longer with the speakers he describes the ‘very clean bass delivery‘, ‘with excellent agility, plenty of bass detail, and an exceptionally wide dynamic range‘. The midrange is labelled ‘quite outstanding‘ with examples of new revelations in the performances. Paul’s experience with the treble region is especially interesting because there are parallels with the reactions of some customers who take time to adjust to a system that does not sound like their own. The Vivace treble is produced by the extraordinary Mundorf Air Motion Transformer that is rather like a 4-litre engine doing 40mph – effortless and with very low distortion. In this way it has massive reserves of headroom and is very smooth, ‘silky smooth‘ in Paul’s words. When there is distortion or resonance in any system component it will tend to accentuate matching frequencies in the music, making them stand out – so minimal distortion equals minimal accenting. Later Paul concludes ‘this speaker doesn’t sound in the least bit dull, and actually seems very well judged‘. Overall ‘its magnificent dynamic range, fine timing and superior coherence actually provide rather more information about the recording processes than any other speaker I can readily recall‘ – from one of the most experienced loudspeaker reviewers. Yes. That is why we added them to our portfolio. Vivaces can be finished in almost any colour or with a wide choice of wood veneers. A carbon fibre baffle is another option, as above.